Jamie Vardy found the net twice as a revitalized Leicester City restarted their league campaign on a winning note post sacked manager Claudio Ranieri by sinking Liverpool 3-1. 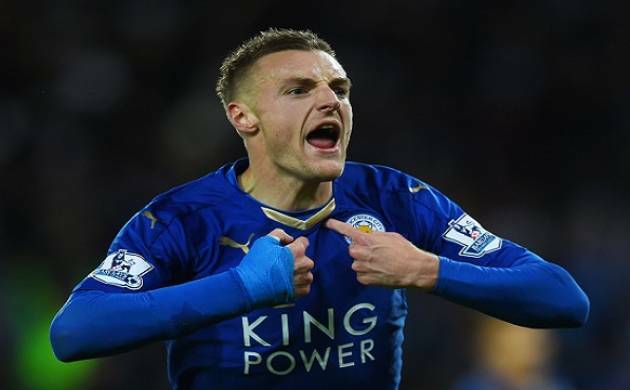 Star striker Jamie Vardy found the net twice as a revitalised Leicester City restarted their league campaign on a winning note post sacked manager Claudio Ranieri by sinking Liverpool 3-1. Ranieri, 65, was dismissed last Thursday, nine months on from Leicester's fairytale title win, and fans honoured him with banners, masks and a smartphone light show in the 65th minute. His former charges were unrecognisable from recent weeks, with Danny Drinkwater also on target on as they snap peda run of five straight defeats to climb out of the relegation zone to 15th place. "All I asked of the team was to remember what they were about and remember their identity," said Leicester caretaker manager Craig Shakespeare. Both Vardy and Drinkwater said Leicester's display had been a reaction to press reports implicating the players in Ranieri's exit. Vardy's first-half opener was Leicester's first league goal in seven games and made them the last team from Europe's five major championships to find the net in 2017. While the display will give Leicester's fans hopes of a late-season rally under Shakespeare, it leaves unanswered questions about why things had gone so badly wrong under Ranieri. Asked if he wanted the job full-time, Shakespeare said: "My remit was get them ready for Liverpool and I have done that. Let's see what happens." Liverpool could have provisionally gone third with victory, but instead they remain fifth, 14 points below leaders Chelsea and a point behind fourth-place Arsenal having played a game more. Jurgen Klopp's side, who replied through Philippe Coutinho, have won only one of their last seven league games and look a shadow of the team who looked poised to challenge for the title just weeks ago. "We let them be the Leicester of last year that's our fault," Klopp said. The first sign that Leicester's players might be about to wind the clock back came on the team sheet, where Shinji Okazaki replaced Ahmed Musa from last week's 2-1 Champions League loss away to Sevilla.